We received this letter from Blake Rowe, co-founder of ECOBAGS.com. He asked that we spread this information widely because our friends and followers on Facebook and Twitter can move mountains when moved! Due to all the rain we’ve had this year, bees have not been able to collect enough food to survive the winter. 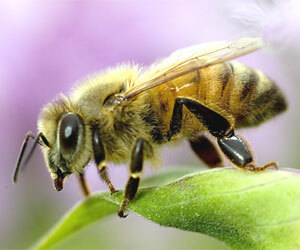 It is expected that we may lose up to 75% of our bees. The bees need our help. Bring water to boil, add sugar and stir until dissolved. Steep until completely cooled down. Place in zip lock bags on a cookie sheet. Place small holes in bag. Place feeder somewhere on your property away from people and pets. Feeding the bees will help them make it through the winter. Please pass this info on to friends that have yards large enough to do this. *Editor’s note: We’ve been having freezing temps at night already in the Northeast so place in a sunny-ish spot so it doesn’t freeze!